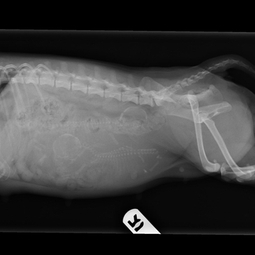 Digital x-rays are fast and easy to capture, making them safer for your pet and our staff. We have the IDEXX I-Vision CR system which produces images within 30 seconds enabling a more rapid diagnosis and treatment for our patients. Our digital x-ray system is fully integrated with our computer system so that the images that we take will always be in your pet's medical file. We can also email them or prepare them on a CD for your pet's records at any time necessary.